Perhaps it’s the many hours of darkness in the Alaskan winter. Throughout this vast region, the celebration of Our Lord’s birth begins early and ends very reluctantly. In many homes, you’ll find window lights and decorated trees as early as Thanksgiving Day. Over KNOM, you’ll hear hymns and Christmas carols throughout the month of December, with a volunteer-produced radio play almost every day. It’s a time when our mission station really sparkles. As we gather to celebrate the birth of Christ, we will especially remember you in our prayers, as we do every day. We pray that God keep you close, and that He protect and guide you and those you love. May you enjoy a wonderful, blessed Christmas! 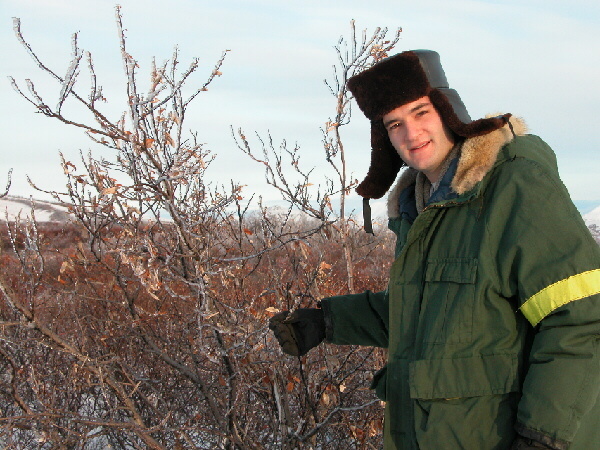 TREE’S COMPANY (left): KNOM volunteer public affairs specialist Clinton White checks out ice-covered willow bushes on a mountainside north of Nome. We live on tree-less tundra, and these little willows are the closest thing to trees you’ll find. The cost of air freighting traditional firs is high, and one of these ice-covered willows will serve as the KNOM studio’s holiday tree. SPOT CHECK: KNOM broadcasts four inspirational and four educational spots each hour. Recent educational spots taught science and history, affirmed Alaska Native culture, taught nutrition, exercise, safety, domestic violence, child abuse and dealing with alcoholic parents, among many other topics. Thank you for making this work possible. INSPIRATIONAL SPOT: When Jesus called that Christmas week, I wasn’t at my best and the house was much too cluttered to entertain a guest. He seemed to notice everything: the cards still unaddressed, the gifts piled high awaiting wraps, the baking and the rest. THAR’S GOLD! (left) Our mission was honored with six Alaska Broadcasters Association Goldie Awards this autumn. At left, business manager Florence Busch received a standing ovation at the Anchorage awards ceremony, as she was proclaimed Alaska Broadcast Employee of the Year. The accolade came as a great surprise. As the dedicated hard work of the award-winner was being praised, Florence joked “this person needs a life!” a moment before her image was projected on the screen. Next to Florence is Amy Flaherty, whose programs on the whaling festival in the village of Point Hope won Best Radio News Feature Series. Amy also holds KNOM’s award for Best Radio Web Site. At center, news director Paul Korchin’s Iditarod Race coverage won Best Radio Sports Event. And at right, Julia Dunlap holds the Best Radio Entertainment Program award, won by former KNOM’ers Andrew McDonnell and Mike Nurse, and the Goldie for Best Radio Service to the Community, which she and Paul won for their investigative reporting into organic pollutants left by the government in villages on St. Lawrence Island. As we have said many times, the best awards are the loyalty of our listeners and of the many friends who make our work possible. Thank you! LIGHT NEWS: We’re all looking forward to December 23rd, the day when our daylight begins to increase again. For several days, Nome sees only 3 hours 54 minutes of very low-angle sun. At high noon, a 6-foot person casts a shadow 170 feet long! Please consider adding missions like KNOM to your will. Such a gift can make a great positive difference in thousands of lives for many years. INSPIRATIONAL SPOT: As I put up my Christmas tree, help me, Lord to decorate my life, too. For each ornament I hang, let me bring a kindness to someone. For each bright colored light, a smile and a laugh to another, so that my life radiates joy as much as my tree. TOGETHER (left): Since August, it’s been impossible to capture everyone on the KNOM staff in one photograph, due to staff travel for news gathering, volunteer recruiting and a couple of well-deserved vacations. This is the best that we could do, in the first week of November, with volunteer music director Anna Dummer on a trip and spiritual director Fr. Mark Hoelsken, SJ pastoring in villages, as he does 99% of the time. Bottom row, from left: volunteer public affairs specialist Clinton White, business manager Florence Busch, volunteer production director Emily Barrett, development specialist Lynette Schmidt and program director Ric Schmidt. Top row, from left: assistant program director Kelly Brabec, general manager Tom Busch, volunteer public affairs director Amy Flaherty, news director Paul Korchin and volunteer deputy news director Julia Dunlap. We send you our warmest greetings! KNOM is the oldest Catholic radio station in the United States, beaming strong thanks to you. INSPIRATIONAL SPOT: Blessed Child upon the hay, please listen to my prayer, for I am a sinner and miles away from Bethlehem. I have no frankincense or gold. The shepherds brought you sheep. I don’t have even a lamb. I have only my heart, Blessed Child, but if You accept it, it will soon glow with love. And as years pass, I know it will become a joy to you. Blessed Child now grown, listen to my prayer today. For I am a sinner and miles away from Bethlehem. INSPIRATIONAL SPOT: Falling snow…Christmas carols…lights glistening…the special sights and sounds of church at Christmas…It’s the most memorable and nostalgic time of the year. And such an appropriate time to make peace in our families and among relatives and friends. Are there any old wounds in us that need healing? God promised peace on earth to those of good will. And He keeps His promises. 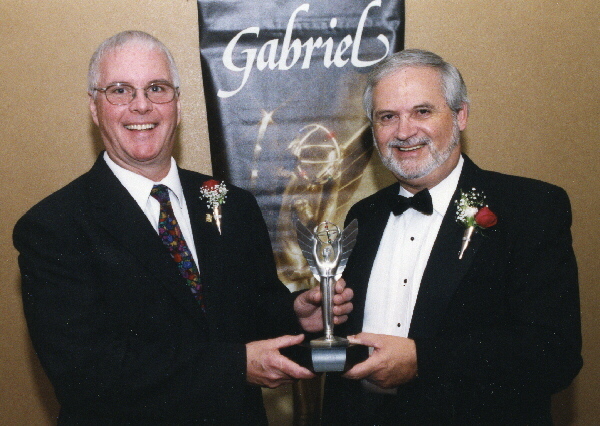 VERY ACCEPTING (left): At left, KNOM general manager Tom Busch accepts KNOM’s 2003 Gabriel Radio Station of the Year Award from Frank Morock, president of the Catholic Academy of Communications Arts Professionals. Our 11th Gabriel was presented at a ceremony in St. Louis. KNOM is the only small station, and the only religious station, to win this prestigious award, which was created to encourage positive use of radio and television. THIRTY YEARS AGO: Christmas 1973, KNOM produced its first Christmas play, Dickens’ “A Christmas Carole,” produced by and starring volunteer engineer Roy Wells as Scrooge. The elaborate program, assembled by volunteer Peter Van Nort, remains one of KNOM’s best efforts. It barely made it on the air: Pete was splicing the second half of the taped program, using sticky tape and a razor blade, while the first half was playing on the air! That month, a local family’s Christmas gift to the staff was fresh milk, a luxury which the mission could not afford to provide its volunteer workers. HEROINE: A six-year-old girl in the village of Toksook Bay is credited with saving two little boys from drowning. Little Cecelia Pitka heard screams coming from the bay and discovered that her younger brother Mark had fallen through the new, thin ice. She ran for her father. He and others found Mark face down in the water, and when they pulled him out, discovered a 3-year-old boy beneath him. Both boys were unconscious, but were revived with C.P.R., and have made full recoveries. There is so much tragic news to report that you can imagine how delighted the KNOM news crew were to announce this story over the air. 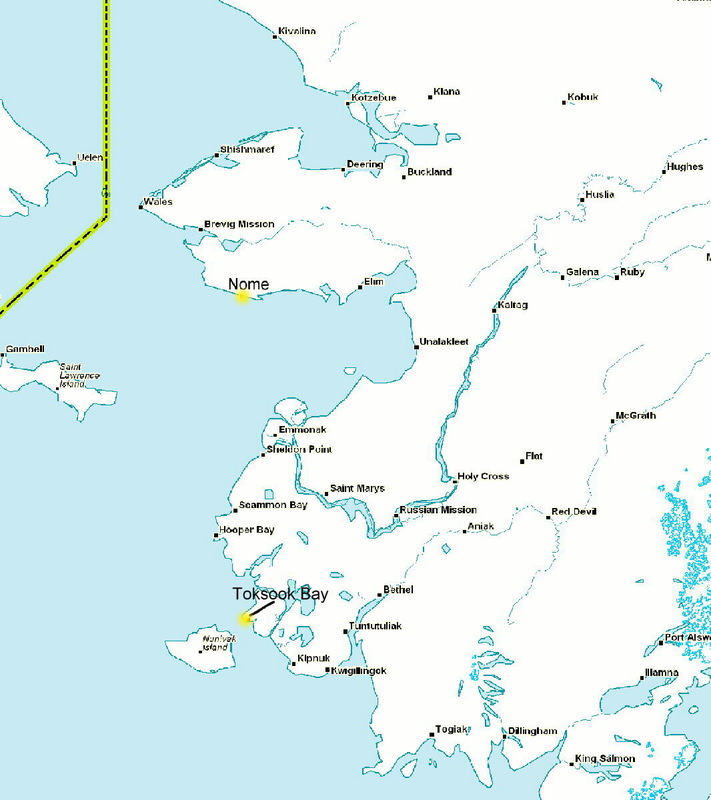 (Left) This image locates Toksook Bay in relation to Nome. 274 miles south of Nome on the rugged Alaska coast, Toksook Bay is a village where Yup’ik Eskimo traditions remain strong. KNOM reception is spotty there, and it’s one of thirteen locations for which we’ve applied to install a translator, which is a low-power transmitter that will provide the village an excellent KNOM signal. Thank you once again for your financial help and your prayers. From everyone on the KNOM staff, we send you prayers, fond greetings, and wishes for you to enjoy a holy Christmas that is filled with joy. May God greatly bless you. INSPIRATIONAL SPOT: It’s Christmas. Let us love. Now that we have been shown how. Copyright © 2003 KNOM. All rights reserved.